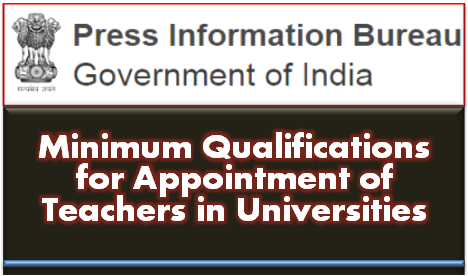 Ph.D Degree shall be mandatory requirement for Direct Recruitment to the post of Assistant Professors in University with the effect from 1st July, 2021. Incentives to teachers as provided in the earlier Regulations of 2010 and subsequent amendments have been retained. These include incentives for M.Phil/Ph.D. API based PBAS System has been removed. A new simplified teacher evaluation grading system has been introduced and research score added for Universities to improve research output. Promotion criteria under CAS for University teachers has been made more research oriented while in case of College teachers, CAS criteria is more focused on teaching. For the first time provision for promotion in Colleges will be up to Professor level. Special provision for recruitment of Assistant Professors in Universities and Colleges for Ph.D Degree holders from a University/Institution in the top 500 Global rankings has been made. The Regulations mandate introduction of one month induction programme for newly recruited Assistant Professors in Universities/Colleges/Higher Education Institutions. Ph.D Degree has been made mandatory for promotion to Assistant Professor (Selection Grade) in colleges from 01.07.2021. Ph.D Degree will be mandatory for direct recruitment to Assistant Professors in Universities w.e.f. 01.07.2021. For the first time, weightages are assigned for CAS in respect of MOOCs and E-Content in Universities and Colleges. Research clusters will be created in the Universities within the State for sharing research facilities, skills and infrastructure to ensure optimal utilization of resources and creating synergies amongst higher education institutions. Up to 10% of the existing sanctioned strength of Professors in Universities shall be appointed as Senior Professors in the Universities. Senior Professors in Universities will be appointed through direct recruitment and through promotion under CAS. Special category of medal winners in Olympics, Asian Games and Commonwealth Games in eligibility criteria for Assistant Director/College Director, Physical Education and Sports and Deputy Director, Physical Education and Sports in Universities has been made to promote sports in Universities and Colleges. Note: Ph.D Degree shall be mandatory requirement for Direct Recruitment to the post of Assistant Professors in University with the effect from 1st July, 2021. However Masters degree with NET or Ph.D. will continue to be the minimum eligibility requirement for Direct Recruitment to the post of Assistant Professors in colleges.